3. 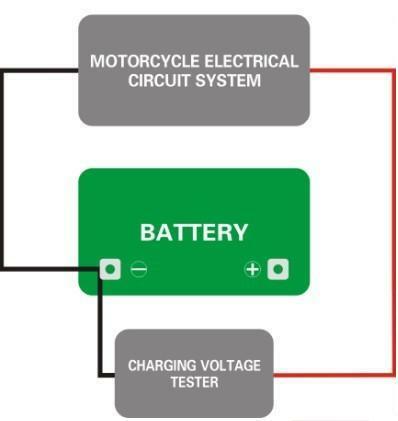 Choose correct corresponding engine start lithium ion batteries accordingly to motorcycle model or lead acid model. 5. 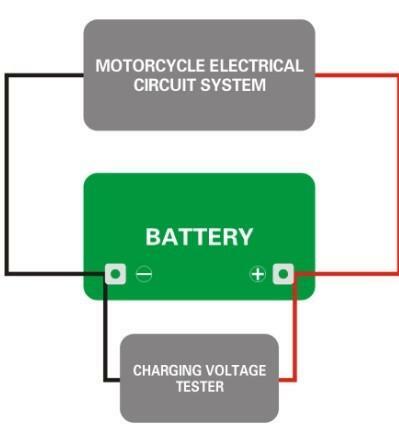 Take out the lead acid battery according to motorcycle guide, please make sure disconnect the negative screw and wire, then positive. which avoid the short circuit. First, check the battery polarity, two kind battery must be same, please contact me if different. Then check two kind battery dimension, length, width and height, please contact us if the lithium ion battery be too big to install. Normally. Our lithium ion battery will be same as original battery or smaller, you can install the battery directly if same dimension. If smaller dimension, we adopt following two method to adjust the battery dimension. 7. 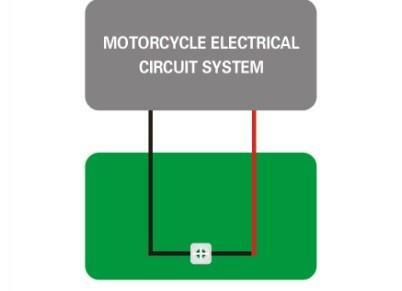 Please make sure motorcycle positive and negative wire connect the battery terminal correctly and hardly, Positive first, then negative, which avoids the short circuit. 1. Both vehicle and battery charger need to limit voltage between 14.0-15.0 volts when charging. The battery cannot be full charged if charging voltage less than 14.0 Volts, and the battery would be damaged if the charging voltage over 15.0 Volts. 2. Always remove the battery from the vehicle before charging separately. 3. Charge the battery with a lower current than the MAX Charging Current found on the Charging label. 4. After charging, leave the battery for 1 to 2 hours before checking the voltage. If the voltage is less than 12.4 volts, additional charging is necessary. 5. If the battery becomes hot to the touch, stop charging. Allow battery to cool before resuming. 1. The battery should be stored with 70% charge state (approx). 2. 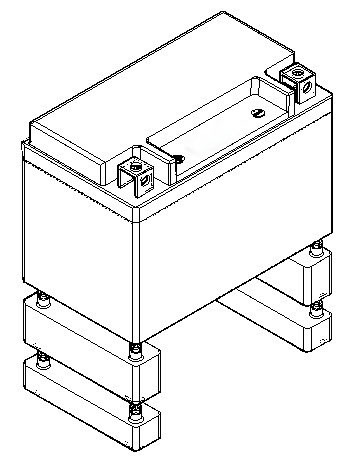 The battery should be stored in a clean, dry and ventilated environment (-20-40Cels), not in contact with any corrosive substance and away from heat and fire. 3. The battery should be charged completely once every 180 days when in storage. 1. The battery should be transported with 70% charge state (approx). 2. The battery should be packed with insulation and shockproof material to avoid damage from sudden jolts and collision. 3. The battery should be handled with care when loading and unloading during transport. Do not throw the batteries and avoid collision. 4. Do not transport the batteries together with flammable, explosive objects, or sharp metal goods. 1. Disconnect the battery cable always is the best choice if the vehicle is in storage or used infrequently. Or use a standard maintainer or charger to maintain the battery. Or regular charging the battery. 2. If the battery stands by for any period of time, check the voltage in case lower 12.4 Volts, recharge as described on the charging label. 3. Keep the connecting poles clean and securely fastened. 4. 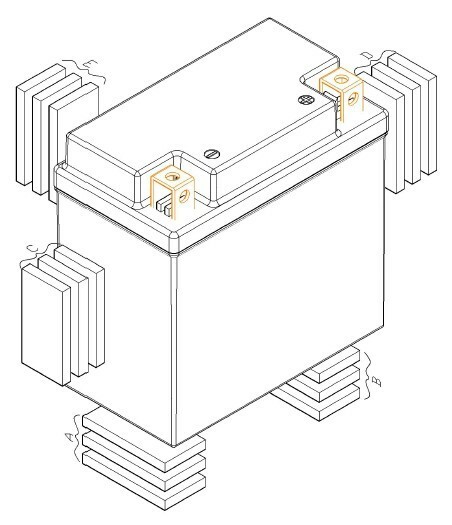 The battery is factory sealed and requires no topping up of any fluid. Never attempt to open the battery. 1. Do not immerse the battery in water. 2. Do not use or store the battery near sources of fire or heater. 3. Do not reverse the positive (+) or negative (-) terminals. 4. Do not connect the battery directly to wall outlets. 5. Do not put the battery into a fire or apply direct heat to it. 6. Do not short-circuit the battery by connecting wires or other metal objects to the positive (+) and negative (-) terminals. 7. Do not pierce the battery casing with a nail or other sharp objects, break it open with a hammer, or step on it. 8. Do not strike, throw, or subject the battery to sever physical shock. 9. Do not directly solder the battery terminals. 10. Do not attempt to disassemble or modify the battery in any way. 11. Do not place the battery in a microwave oven or pressurized container. 12. Do not use the battery in combination with primary batteries (such as dry cell batteries) or batteries of different capacity, type, or brand. 13. Do not use the battery if it gives off an odor, generates heat, becomes discolored or deformed, or appears abnormal in any way. If the battery is in use or being recharged, remove it from the device or charger immediately and discontinue use. 14. Do not fit extra Audio, Anti-theft lock and other electro-device on vehicle by yourself. 15. Do not use more than one battery in parallel or in series. 16. Do not press on indicator button longer than few seconds. 17. Do not dispose the battery before completely discharge. 18. Do not charge the battery by charging voltage over 15.0V. 19. Do not charge the battery by charger with an automatic “desulfation mode” function. 21. The cranking performance will be affected when environment temperature lower than -5℃. 22. Keep out of reach of Children and Pets. If the problem caused by wrong operation, Skyrich won’t take responsibility for that, Please fill in the warranty card completely and stick on the battery surface, send the battery back company. Otherwise the Skyrich won’t be attend to or serve. Electrolyte inside the battery is harmful to the skin and eyes. If the battery leaks and electrolyte gets in your eyes, do not rub them, instead, rinse them with clean running water and immediately seek medical attention. If left untreated, electrolyte can cause eye permanent injury.